After her death at St Charles in 1852, Philippine was buried in the grounds of the convent and school. Following her beatification in 1940 her remains were moved into a specially built shrine beside the school. It's a simple, spacious place; quiet, peaceful and full of light. The altar occupies the centre, and, nearby, Philippine reposes in an unadorned marble sarcophagus. And this was where my little group ended our visit, sitting in silent prayer. We say Philippine rests here; but I believe she doesn't rest, because we don't let her. 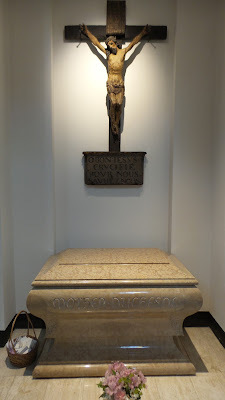 Beside the sarcophagus is a small basket, almost overflowing with prayer intentions written on the slips of paper beside it. The Woman Who Prays Always, who was devoted to the Society and spent her life in hard work and busyness, is spending her eternity praying and being busy on our behalf - and maybe this, for her, is heaven. In my group were RSCJ from several countries and various missions, including one very new one. Some came from a newly formed region which has been named after her, and we're only a year after a Chapter which drew inspiration from her pioneering spirit. All of these and more, I'm sure, were in the intentions confided to Philippine's prayer and left in the little basket. Our first missionary continues to reach new frontiers, to inspire and impel us ever onward and outward in answering God's call to make known the love of his Heart in new places and ways. In life Philippine may well have considered herself useless and an encumbrance, but I'm sure that in heaven she has discovered that she was - and continues to be - anything but.